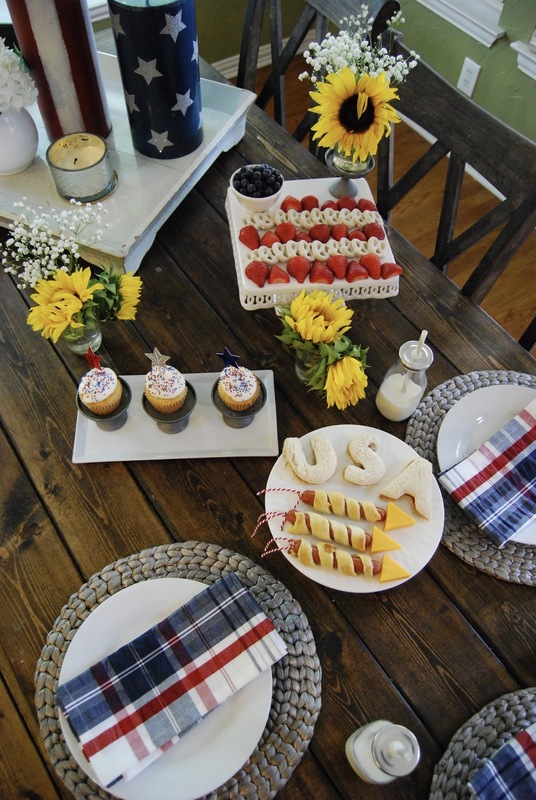 Last week I put together a quick little patriotic dinner for the kids on a night when Dave was working. I made "rocket dogs" as I have in the past and they were just as big of a hit as they've been in years past. I didn't have skewers this time so I baked the crescent roll wrapped turkey dogs and then put the cheese on top with a toothpick. They just didn't look right without a "tail" so I tied some twine onto another toothpick to make it look more like a rocket. The USA sandwiches are peanut butter and jellies that I cut with these cookie cutters. Strawberries, blueberries and yogurt covered pretzels from Trader Joe's. EASY! I wanted a festive dessert that didn't involve more strawberries so I settled on my regular "white cupcakes" as my kids call them made a little bit more festive thanks to some red, white and blue nonpareils. And, of course... the cupcakes were the stars of the show! I know that they don't care about the decor, the pretty napkins or that I made a flag out of fruit and yogurt pretzels... but I think they'll always remember that I took great JOY in doing these special little lunches and days for them. And I hope that y'all filed away an idea (or a couple!) for upcoming festive occasions. So... about the cupcakes. I've made these for YEARS and they're my go-to for parties. They're easy and taste AMAZING!!! Plus, you can customize them with sprinkles, food coloring, toppers, etc. to fit your theme and you're good to go! 1) Mix the cake mix, melted butter, eggs and water together on slow speed for 1 minutes. Beat for an additional couple of minutes on high until the batter is thick, but fluffy at the same time. It won't be runny and such like a regular cake mix. So here's where it's about to get janky... I pipe my icing onto the cupcakes using a gallon ziplock bag. #classy :) I put the bag into a big measuring cup to make it easier to fill. Then I cut off the corner of the bag and pipe the frosting onto the cupcakes. The end. I get TONS of compliments on these and I don't think you'd ever know that they come from a box mix (kind of). If you make these and try themI'd love to know what you think! Happy Baking!!! PS - This post contained a few affiliate links. Thank you for supporting my blog! Glad I'm not the only one that uses a ziplock instead of a fancy icing bag. Such a fun, festive and simple way to celebrate! Girl! I've tried the "real bags" and never had any luck! I can't get over how cute and festive that table is!! I absolutely LOVE your blog! You feature some of the best recipes and I love all the fun things you do with your kiddos! I am definitely going to be baking a batch of these! Question? Can they vanilla cake be switched for chocolate or any other flavors just for more varieties/options? So glad you enjoy the recipes!!! I've used this same method with box mix to make chocolate and strawberry and it works great! I LOVE your festive table.....so pretty!!!! O.M.G. Will you be my mama? Those little rockets!!!!! What fun! And it's perfectly acceptable to pipe frosting with a large baggie. :) I think I'll make those cupcakes for the 4th (which is also my dad's birthday). Thanks for sharing! Yay! Let me know what you think and happy early birthday to your dad!!! Such a cute lunch! I love the way you displayed the cupcakes. Are those pillar candle holders or are they made for cupcakes? Absolutely love this patriotic idea! I also use ziploc bags for frosting cupcakes. And since I hate getting cake mix everywhere, I use them to fill the cupcake pans too. Just cut a bigger hole. I'm totally going to do that next time! What a great idea! I'm trying this cupcake recipe this week! I feel like vanilla cake is the hardest to make taste good. Chocolate is easy, but I have been looking for a good vanilla cupcake recipe! Thanks for sharing so your readers get these cute little ideas! We appreciate it. Off to make a festive lunch for my babes. Can you share where we can purchase the cupcake stands? 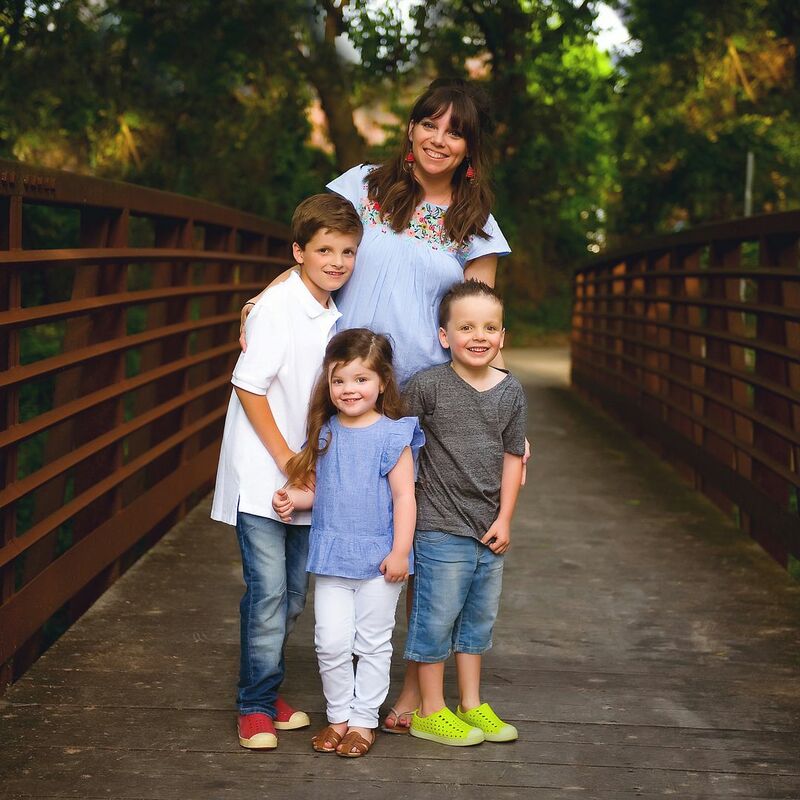 I love your blog....I so enjoy all the sweet, fun things you do with your kiddos! My two are 17 and 20 now....and it makes me so sad......I want to go back and do all the neat things you do with yours! ;-) There are seasons, so I'll just need to think of some sweet things to do for their age! Thanks for sharing!!! You need to start a "grandma file" ;) hahaha I bet your kids would get a kick out of rocket dogs now though - Dave and I love them as much as the kids! I will be trying these cupcakes for sure. Thanks for sharing your recipes. I have made several of them over the years. Simply love your decorating! Your kiddos are blessed. Love this! We are having friends over on the 4th and will have a lot of toddlers running around. 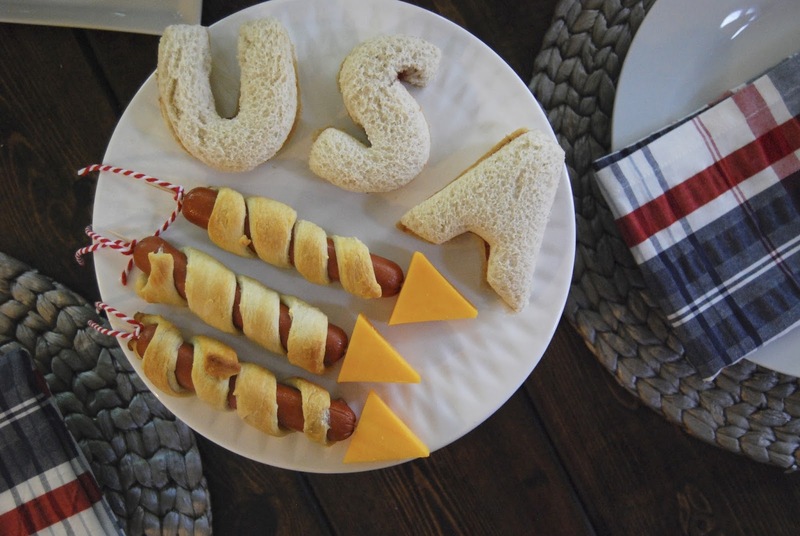 This will be a perfect 4th of July lunch for all of us. Perfect ideas! You are the most festive holiday mom :) When you're not busy being the best mom, wife and math teacher, you should open an interior design / event planning business in downtown McKinney. Oh goodness!!! So so so sweet!!! Thank you! Made cupcakes delicious. Frosting awesome. Decorating with bag even easier. My cupcakes almost looked good enough to sale. Thanks for all your posts. Hello!!! I am a devoted reader to your blog and think it's so special that you do stuff like this for your kids! :) also- on a side note I am watching The Little Rascals right now and oh my goodness Griffin looks SO MUCH like the little girl Darla in the movie... so cute! I've heard that before and think I need to go rewatch it!!! Thank you so much for reading!!! Those are some lucky little babies you've got. I'm sure they'll have sweet memories. Such a darling lunch! Love reading your blog from all the way down here in New Zealand :-) just a little confused do you disregard the directions on the cake mix box? Yes! Disregard the box directions! Thank you so much for reading! Andrea! Where did you get those adorable "milk bottle" glasses for the kids? Thanks so much, these are great party ideas! I always love to read your posts. You always have the greatest family things to share. I so wish you could have been here to help me with my daughter's graduation party. Your cupcakes look way better than ours did. My only hope is that she will remember that we made them together for her special day. This is so fun!! Totally trying that cupcake recipe, thank you! I can't wait to make these cupcakes for my daughters preschool party! Do they need to be stored in the fridge? adorable home entertainment!!! your family is so lucky that you are taking time to make these special memories and what could be an everyday lunch so UNforgetable!!! !